So far, throughout this primer, I’ve claimed that central banks have one overarching task to perform: their job, I said, is to “regulate the overall availability of liquid assets, and through it the general course of spending, prices, and employment, in the economies they oversee.” I’ve also shown how, prior to the recent crisis, the Fed pursued this task, sometimes competently, and sometimes ineptly, by means of “open-market operations,” meaning routine purchases (and occasional sales) of short-term Treasury securities. But this picture isn’t complete, because it says nothing about central banks’ role as “lenders of last resort.” It overlooks, in other words, the part they play as institutions to which particular private-market firms, and banks especially, can turn for support when they find themselves short of cash, and can’t borrow it from private sources. For many, the “lender of last resort” role of central banks is an indispensable complement to their task of regulating the overall course of spending. Unless central banks play that distinct role, it is said, financial panics will occasionally play havoc with nations’ monetary systems. Eventually I plan to challenge this way of thinking. But first we must consider the reasoning behind it. The conventional view rests on the belief that fractional-reserve banking systems are inherently fragile. That’s so, the argument goes, because, unless it’s squelched at once, disquiet about any one bank or small group of banks will spread rapidly and indiscriminately to others. The tendency is only natural, since most people don’t know exactly what their banks have been up to. For that reason, upon hearing that any bank is in trouble, people have reason to fear that their own banks may also be in hot water. Because it’s better to be safe than sorry, worried depositors will try to get their money back, and — since banks have only limited cash reserves — the sooner the better. So fear of bank failures leads to widespread bank runs. Unless besieged banks can borrow enough cash to cover panicking customers’ withdrawals, the runs will ruin them. Yet the more widespread the panic, the harder it is for affected banks to secure private-market credit; if it spreads widely enough, the whole banking system can end-up going belly-up. An alert lender of last resort can avoid that catastrophic outcome, while also keeping sound banks afloat, by throwing a lifeline, consisting of a standing offer of emergency support, to any solvent bank that’s threatened by a run. Ideally, the standing offer alone should suffice to bolster depositors’ confidence, so that in practice there needn’t be all that much actual emergency central bank lending after all. A striking feature of this common understanding is its depiction of a gossamer-like banking system, so frail that the merest whiff of trouble is enough to bring it crashing down. At very least, the depiction suggests that any banking system lacking a trustworthy lender of last resort, or its equivalent, is bound to be periodically ravaged by financial panics. that the lack of heavy-handed banking regulations is also a poor predictor of the frequency of banking crises. Instead, some heavily-regulated banking systems have endured crisis after crisis, while some of the least regulated systems have been famously crisis-free. That the conventional theory of banking panics is not easily reconciled with historical experience may help to explain why its proponents often illustrate it, as Ben Bernanke did in the first of a series of lectures he gave on the subprime crisis, not by instancing some real-world bank run, but by referring to the run on the Bailey Bros. Building & Loan in “It’s a Wonderful Life”! 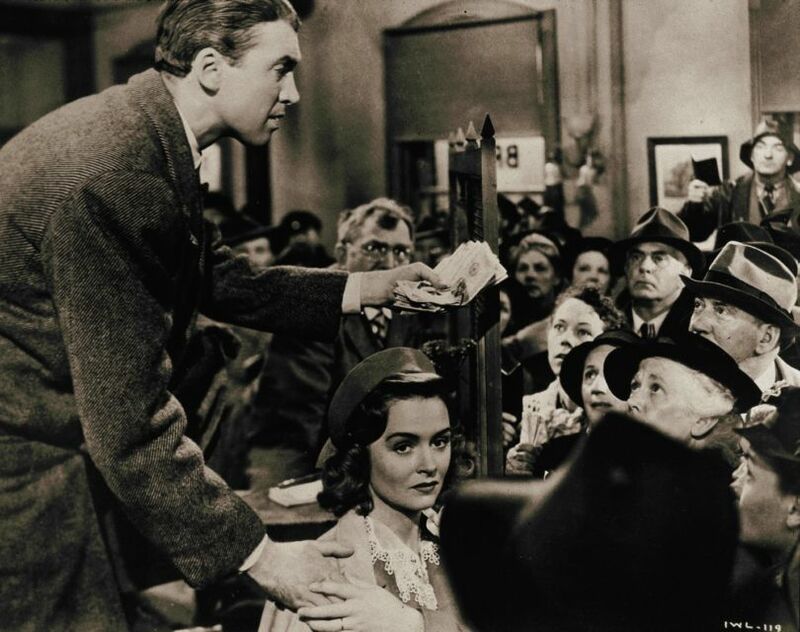 In the movie, although George Bailey’s bank is fundamentally sound, it suffers a run when word gets out that Bailey’s absent-minded Uncle Billy mislaid $8000 of the otherwise solvent bank’s cash. George Bailey is en route to his honeymoon when he sees a crowd gathered outside his family business …. He finds that the people are depositors looking to pull their money out because they fear that the Building and Loan might fail before they get the chance. His bank is in the midst of a run. As the movie hints at, the liquidity risk that banks face arises, at least to some extent, from the services they provide. At their core, banks serve as intermediaries between savers and borrowers. Banks take on short-maturity, liquid liabilities like deposits to make loans, which have a longer maturity and are less liquid. This maturity and liquidity transformation allows banks to take advantage of the interest rate spread between their short-term liabilities and their long-term assets to earn a profit. But it means banks cannot quickly convert their assets into something liquid like cash to meet a sudden increase in demand on their liability side. Banks typically hold some cash in reserve in order to meet small fluctuations in demand, but not enough to fulfill all obligations at once. There you have it: banks by their very nature are vulnerable to runs. Hence banking systems are inherently vulnerable to crises. Hence crises like that of 2007-8. Hence the need for a lender of last resort (or something equivalent, like government deposit insurance) to keep perfectly sound banks from being gutted by panic-stricken clients. But is that really all there is too it? Were the runs of 2007-8 triggered by nothing more than some minor banking peccadilloes, if not by mere unfounded fears? Not by any stretch! For starters, the most destructive runs that took place during the 2007-8 crisis were runs, not on ordinary (commercial) banks, or thrifts (like George Bailey’s outfit), but on non-bank financial intermediaries, a.k.a. “shadow banks,” including big investment banks such as Bear Stearns and Lehman Brothers, and money-market mutual funds, such as Reserve Primary Fund. Far from having been random or inspired by shear panic, all of these runs were clearly information based: Bear and Lehman were both highly leveraged and heavily exposed to subprime mortgage losses when the market for such mortgages collapsed, while Reserve Primary — the money market fund that suffered most in the crisis — was heavily invested in Lehman Brother’s commercial paper. As for genuine bank runs, there were just five of them in all, and every one was triggered by well-founded news that the banks involved — Countrywide, IndyMac, Washington Mutual, Wachovia, and Citigroup — had suffered heavy losses in connection with risky mortgage lending. Indeed, with the possible exception of Wachovia, the banks were almost certainly insolvent when the runs on them began. To suggest that these banks were as innocent of improprieties, and as little deserving of failure, as the fictitious Bailey Bros. Building and Loan, is worse than misleading: it’s grotesque. Not having been random, the runs of 2007-8 also weren’t contagious. The short-term funds siphoned from failing investment banks and money market funds went elsewhere. Relatively safe “Treasuries only” money market funds, for example, gained at riskier funds’ expense. The same thing happened in banking: for every bank that was perceived to be in trouble, many others were understood to be sound. Instead of being removed, as paper currency, from the banking system, deposits migrated from weaker to stronger banks, such as JP Morgan, Wells Fargo, and BB&T. While a few bad apples tried to fend-off runs, in part by seeking public support, other banks struggled to cope with unexpected cash inflows. Yet because the runs were front-page news, and the corresponding redeposits weren’t, it was easy for many to believe that a general panic had taken hold. That sound and unsound banks alike were forced to accept TARP bailout money only reinforced this wrong impression. Evidently we have traveled far from the quaint hamlet of Bedford Falls, where George Bailey’s bank nearly went belly-up. Nor were we ever really there. During the Great Depression, for example, most of the banks that failed, including those that faced runs, were rural banks that suffered heavy losses as fallen crop prices and land values caused farmers to default on their loans. Few if any unquestionably solvent banks failed, and bank run contagions, with panic spreading from unsound to sound banks, were far less common than is often supposed. Even the widespread cash withdrawals of February and early March, 1933, which led FDR to proclaim a national bank holiday, weren’t proof of any general loss of confidence in banks. Instead, they reflected growing fears that FDR planned to devalue the dollar upon taking office. Those fears in turn led bank depositors to cash in their deposits for Federal Reserve notes, in order to convert those notes into gold. What looked like distrust of commercial banks’ ability to keep their promises was really distrust of the U.S. government’s ability to keep its promises. If bank runs are mainly a threat to under-diversified or badly-managed banks, it’s no less the case that banking crises, in which relatively large numbers of banks all find themselves in hot water at the same time, are mainly a problem in badly-regulated banking systems. To find proof of this claim, one only has to compare the records, both recent and historical, of different banking systems. Do that and you’ll see that, while some systems have been especially vulnerable to crises, others have been relatively crisis free. Any theory of banking crisis that can’t account for these varying experiences is one that ought not to be trusted. But just how can one account for the different experiences? The conventional theory of panics implies that the more crisis-prone systems must have lacked a lender of last resort or deposit insurance (which also serves to discourage runs) or both. It may also be tempting to assume that they lacked substantial restrictions upon the activities banks could engage in, the interest rates they could charge and offer, the places where they could do business, and other aspects of the banking business. Wrong; and wrong again. Central banks, deposit insurance, and relatively heavy-handed prudential regulations aren’t the things that distinguished history’s relatively robust banking systems from their crisis-prone counterparts. On the contrary: central bank misconduct, the perverse incentives created by both explicit and implicit deposit guarantees, and misguided restrictions on banking activities including barriers to branch banking, portfolio restrictions, and mandated business structures, have been among the more important causes of banking-system instability. Some of the most famously stable banking systems of the past, on the other hand, lacked either central banks or deposit insurance, and placed relatively few limits on what banks were allowed to do. It would take a treatise to review the whole, gruesome history of financial crises for the sake of revealing how unnecessary and ill-considered, if not corrupt, regulations of all sorts contributed to every one of them. For our little primer we must instead settle for four especially revealing case studies: those of the U.S. and Canada on the one hand and of England and Scotland on the other. The banking systems of Scotland between 1772 and 1845 and Canada from 1870 to 1914 and again from 1919 until 1935 were remarkably free of both crises and government interference. In comparison, the neighboring banking systems of England and the United States were both more heavily regulated and more frequently stricken by crises. To first return again to the Great Depression, in the U.S. between 1930 and 1933, some 9000 mostly rural banks failed. That impressive record of failure could never have occurred had it not been for laws that prevented almost all U.S. banks from opening branch offices, either in their home states or elsewhere. The result was a tremendous number of mostly tiny and severely under-diversified banks. Canada’s banks, in contrast, were allowed to establish nationwide branch networks. Consequently, not a single Canadian bank failed during the 1930s, despite the fact that Canada had no central bank until 1935, and no deposit insurance until 1967, and also despite the fact that Canada’s depression was especially severe. The few U.S. states that allowed branch banking also had significantly lower bank failure rates. Comparing the performance of the Canadian and U.S. banking systems between 1870 and 1914 tells a similar story. Although the U.S. didn’t yet have a central bank, and so was at least free of that particular source of financial instability (yes, you read that last clause correctly), thanks to other kinds of government intervention in banking, and especially to barriers to branch banking and to banks’ ability to issue circulating notes put in place during the Civil War, the U.S. system was shaken by one financial crisis after another. Yet during the same period Canada, which also had no central bank, but which didn’t subject its commercial banks to such restrictions, avoided serious banking crises. of the fullest liberty as to what was rotten and bad; but of the most complete restriction, as to all that was good. By it, a cobbler or a cheesemonger, without any proof of his ability to meet them, might issue his notes, unrestricted by any check whatever; while, on the other hand, more than six persons, however respectable, were not permitted to become partners in a bank, with whose notes the whole business of a country might be transacted. Altogether, this system was one so absurd, both in theory and practice, that it would not appear to deserve the slightest support, if it was attentively considered, even for a single moment. Liverpool made these remarks in the wake of the financial panic that struck Great Britain in 1825, putting roughly 10 percent of the note-issuing cobblers and cheesemongers of England and Wales out of business. Yet in Scotland, where the six-partner rule didn’t apply, that same panic caused nary a ripple. Although Scotland and Canada offer the most well-known instances of relatively unregulated and stable banking systems, other free banking experiences also lend at least some support to the thesis that those governments that governed their banks least often governed them pretty darn well. Nowadays central bankers like to credit Bagehot for the modern understanding that every nation, or perhaps every group of nations, must have a central bank that serves as a lender of last resort to rescue it from crises. Were that actually Bagehot’s view, he might be grateful for the recognition if only he could hear it. In fact he’s more likely to be spinning in his grave. How come? Because far from having been a fan of the Bank of England, or (by implication) of central banks more generally, Bagehot, like Lord Liverpool, considered the Bank of England’s monopoly privileges the fundamental cause of British financial instability. Contrasting England’s “one reserve” system, which was a byproduct of the Bank of England’s privileged status, with a “natural,” “many-reserve” system, like the Scottish system (especially before the Bank Act of 1845 thoughtlessly placed English-style limits on Scottish banks’ freedom to issue notes), Bagehot unequivocally preferred the latter. That is, he preferred a system in which no bank was so exalted as to be capable of serving as a lender of last resort, because he was quite certain that such a system had no need for a lender of last resort! that in this work I have pointed out a deep malady, and only suggested a superficial remedy. I have tediously insisted that the natural system of banking is that of many banks keeping their own cash reserve, with the penalty of failure before them if they neglect it. I have shown that our system is that of a single bank keeping the whole reserve under no effectual penalty of failure. And yet I propose to retain that system, and only attempt to mend and palliate it. I can only reply that I propose to retain this system because I am quite sure that it is of no manner of use proposing to alter it… . You might as well, or better, try to alter the English monarchy and substitute a republic. Perhaps today’s Bagehot-loving central bankers didn’t read those last pages. Or perhaps they read them, but preferred to forget them. If Great Britain was stuck with the Bank of England by 1873, as Bagehot believed, then we are no less stuck with the Fed, at least for the foreseable future. And unless we can tame it properly, we may also be stuck with its “unnatural” capacity to destabilize the U.S. financial system, in part by being all-too-willing to rescue banks and other financial firms that have behaved recklessly, even to the point of becoming insolvent. Consequently, getting the Fed to follow Bagehot’s classical last-resort lending rules may, for the time being, be our best hope for securing financial stability. But doing that is a lot easier said than done. For despite all the lip-service central bankers pay to Bagehot’s rules, they tend to honor those rules more in the breach than in the observance. One need only consider the relatively recent history of the Fed’s last-resort lending operations, especially before 2003 (when it finally began setting a “penalty” discount rate) and during the subprime crisis, to uncover one flagrant violation Bagehot’s basic principles after another. There is, I believe, a better way to make the Fed abide by Bagehot’s rules for last-resort lending. Paradoxically, it would do away altogether with conventional central bank lending to troubled banks, and also with the conventional distinction between a central banks’ monetary policy operations and its emergency lending. Instead, it would make emergency lending an incidental and automatic extension of the Fed’s routine monetary policy operations, and specifically of what I call “flexible” open-market operations, or “Flexible OMOs,” for short. The basic idea is simple. Under the Fed’s conventional pre-crisis set-up, only a score or so of so-called “primary dealers” took direct part in its routine open-market operations aimed at regulating the total supply of money and credit in the economy. Also, those operations were — again, traditionally — limited to purchases and sales of short-term U.S. Treasury securities. Consequently, access to the Fed’s routine liquidity auctions was very strictly limited. A bank in need of last-resort liquidity, that was not a primary dealer, or even a primary dealer lacking short-term Treasury securities, would have to go elsewhere, meaning either to some private-market lender or to the Fed’s discount window, where to borrow from the latter was to risk being “stigmatized” as a bank that might well be in trouble. “Flexible” open-market operations would instead allow any bank that might qualify for a Fed discount-window loan to take part, along with non-bank primary dealers, in its open-market credit auctions. It would also allow the Fed’s expanded set of counterparties to bid for credit at those auctions using, not just Treasury securities, but any of the marketable securities that presently qualify as collateral for discount-window loans, with the same margins or “haircuts” applied to relatively risky collateral as would be applied were they used as collateral for discount-window loans. A “product-mix” auction, such as that the Bank of England has been using in its “Indexed Long-Term Repo Operations,” would allow multiple bids made using different kinds of securities to be efficiently dealt with, so that credit gets to the parties willing to pay the most for it. Deposit insurance can serve a function similar to that of having an alert lender of last resort. Most banking systems today rely on a combination of insurance and last-resort lending. Diamond and Dybig’s famous 1983 model — one of the most influential works among modern economic writings — is in essence a clever, formal presentation of the conventional wisdom, in which deposit insurance is treated as a solution to the problem of banking panics. For critical appraisals of Diamond and Dybvig see Kevin Dowd, “Models of Banking Instability,” and chapter 6 of Lawrence White’s The Theory of Monetary Institutions. Although that badly-needed treatise has yet to be written, considerable chunks of the relevant record are covered in Charles W. Calomiris and Stephen Haber’s 2014 excellent work, Fragile by Design: The Political Origins of Banking Crises and Scarce Credit. I offer a much briefer survey of relevant evidence, including evidence of the harmful consequences of governments’ involvement in the regulation and monopolization of paper currency, in chapter 3 of Money: Free and Unfree. I express my (mostly minor) differences with Calomiris and Haber here.